I had no idea what to call this collar. So I looked up pictures of different collars on the internet starting with 1880’s. Finally a cloth collar with hangsy-downsies appeared with a group of collars labeled Edwardian. I tried to find the style name, but I just can’t think anymore today. So Edwardian it is. The collar has a few holes, otherwise it is in really good condition. I had trouble figuring out how to photograph it, since it stretches out flat at a wide (obtuse) angle. 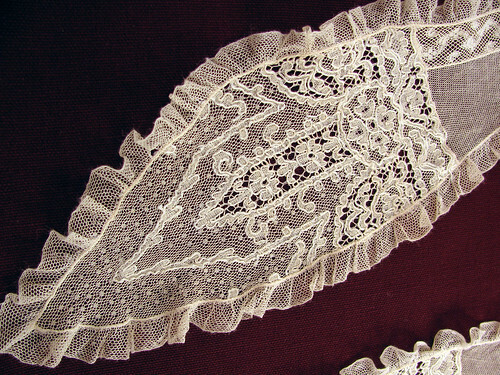 The lace is pieced so meticulously. Look at how the back of the collar is pieced into the front in the closeup photo. I have no idea how this collar was worn. The lace tips are really pretty. They are really long too. I think it would be obnoxious to let them hang down the front, so maybe they were tied. I know I should write more, but I am really tired today. 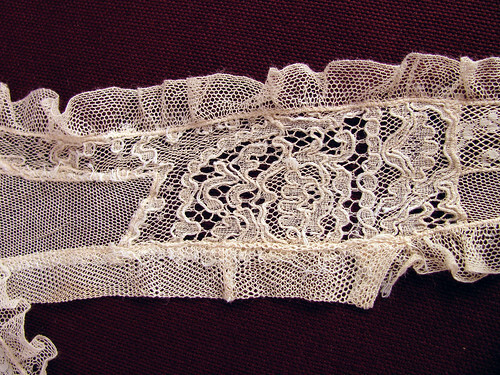 I am trying to teach myself photoshop from a book every morning, In the afternoon I clean the next batch of lace, and then press and photograph something for this blog. In between I have the daily chores. The lace I am soaking at the moment is now the color of a used mop. It was a splotchy brown. It is real Irish crochet so I want to rescue it. Tomorrow I am going to try and dye it a golden color. Wish me luck. 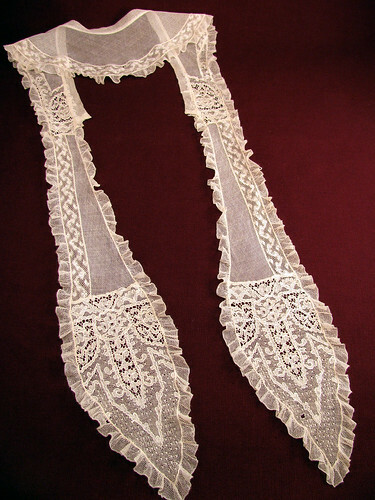 This entry was posted on Sunday, March 29th, 2009 at 3:00 am and is filed under Lace and Vintage. Tagged: Clothing, Lace, Sewing, Vintage. You can feed this entry. You can leave a response, or trackback from your own site.